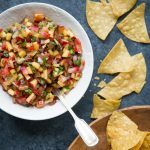 When you think of nectarines, do you think of Chile? Well, if it’s wintertime, you should! The nectarines that you see in your local market from January – March come from Chile, which is in the heart of it’s summer during our winter. Nectarines have a long, long history, originating in China more than 2,000 years ago. The nectarine and the peach are so similar that there is only one gene that separates the two to make them distinct. The nectarine has one recessive gene … the one with the fuzz. So, you could essentially call the nectarine a fuzzless peach! Nectarines are also more delicate than peaches and bruise more easily, so handle with care! While there are numerous varieties of nectarines, the differences are not easily distinguishable for most consumers. The biggest difference is color. 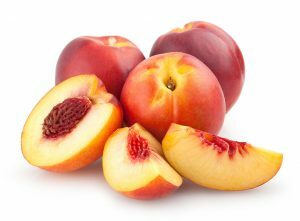 nectarines can be divided into two categories: white flesh and yellow flesh. Nectarines can also be characterized by their pit. Freestone varieties have flesh that separates easily from the pit, while the flesh of a clingstone variety clings to the pit. Yellow nectarines should be eaten when soft and juicy, when they yield slightly to gentle palm pressure. White flesh nectarines are a bit different. They are sweet when still firm and crunchy and can either be enjoyed that way or allowed to soften. It’s just a matter of personal preference. Never refrigerate nectarines, especially before they’re fully ripe. Chilling them before they’re ripe results in mealy, flavorless fruit. Instead, leave them on your counter at room temperature. Want to speed up the ripening process of your nectarines? Place them in a paper bag and store loosely at room temperature. Once ripe, nectarines will keep in the refrigerator for a week. Nectarines are a good source of vitamin C (one serving as 15% of the Daily Value), with just 70 calories per 140g serving. 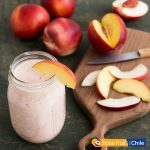 Connect with Fruits From Chile!